出典：A Research Study of 14-35 year olds for the Future Development of Public Libraries Final Report. 2006, p45. (1) MLA et al．A Research Study of 14-35 Year Olds for the Future Development of Public Libraries：Final Report. London, Museums, Libraries and Archives Council. 2006, 76p. (online), available from < http://www.bl.uk/about/cooperation/pdf/publiclibraries.pdf >, (accessed: 2007-05-06). 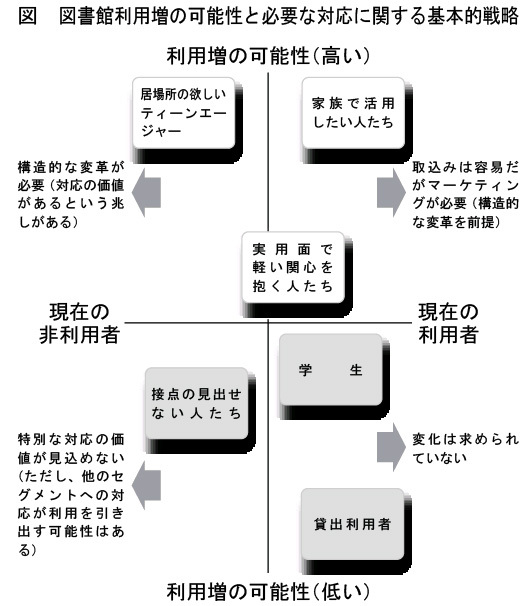 (2) いまなお貸出者の減少は続いている。参照：CIPFA. Public Library Statistics：2006-07 Estimates and 2005-2006 Actuals. Croydon, Statistical Information Service . 2006, p.4. (online), available from < http://www.cipfastats.net/leisure/publiclibrary/default.asp?view=commentary&year=2006&content_ref=5116 >, (accessed 2007-05-06). (3) Reading Agency. Fulfilling their Potential: A National Development Programme for Young People’s Library Services. Chandlers Ford, UK, Reading Agency, 2004, 42p. (online), available from < http://www.readingagency.org.uk/projects/children/fullfilling_potential.html >, (accessed 2007-05-06). (4) Public Agenda. Long Overdue：A Fresh Look at Public and Leadership Attitudes about Libraries in the 21st Century. New York, Public Agenda, 2006, 81p. (online), available from < http://www.lff.org/documents/LongOverdue.pdf >, (accessed 2007-05-06). (5) New York Library Association. “Marist Poll - The Public Library：A National Survey”. (online), available from < http://www.nyla.org/index.php?page_id=801 >, (accessed 2007-05-06). (6) Rosa, Cathy De et al. Perceptions of Libraries and Information Resources：A Report to the OCLC Membership. Online Computer Library Center. 2005, 1 vol. (online), available from < http://www.oclc.org/reports/pdfs/Percept_all.pdf >, (accessed 2007-05-22). (7) American Library Association. @ Your Library：Attitudes Toward Public Libraries Survey 2006. American Library Association, 2006. (online), available from < http://www.ala.org/ala/ors/reports/2006KRCReport.pdf >, (accessed 2007-05-22). American Library Association. “ALA Library Fact Sheet 6：Public Library Use”. (online), available from < http://www.ala.org/ala/alalibrary/libraryfactsheet/alalibraryfactsheet6.cfm >, (accessed 2007-05-22). (9) インターネット調査は社会調査に利用できるか：実験調査による検証結果（労働政策研究報告書 No.17）. 東京. 労働政策研究・研修機構. 2006. p.15-17. 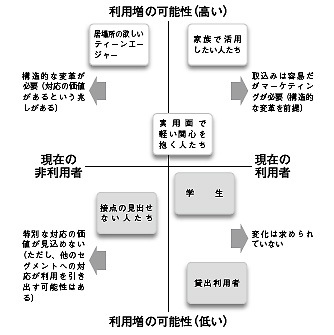 （オンライン版）, 入手先 < http://www.jil.go.jp/institute/reports/2005/documents/017.pdf >, （参照 2007-05-06）. (10) このサンプル数での誤差の範囲は，95％の信頼度でプラス・マイナス3％とされている。 op.cit. (4), p.62. および以下を参照。 “Best Estimates：A Guide to Sample Size and Margin of Error”. Public Agenda. (online), available from < http://www.publicagenda.org/polling/polling_error.cfm >, (accessed 2007-05-06). 佐藤義則. 公共図書館に対する市民の意識調査：英国，米国における2つの調査の視点と方法. カレントアウェアネス. (292), 2007, p.14-19.